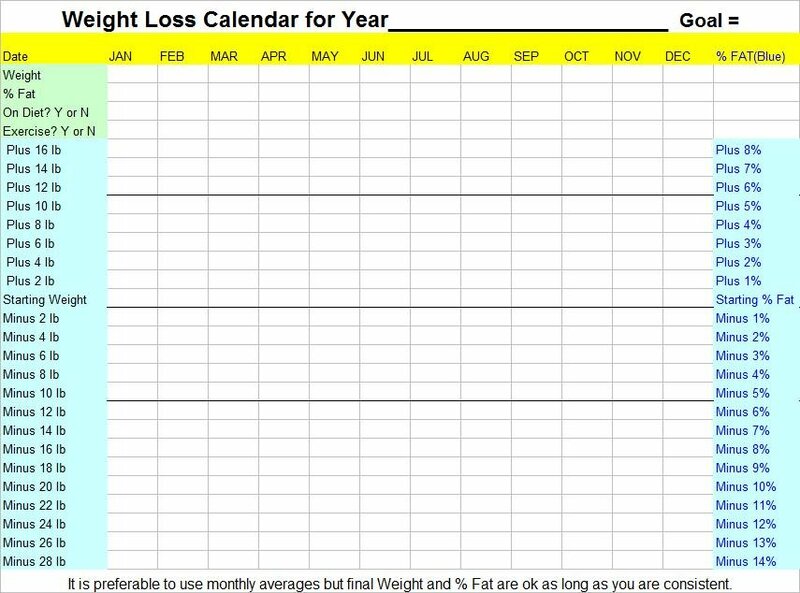 • A good weight loss calendar is not pictures of skinny people to motivate you. • It is not a weight loss tip of the day. • It is not a calendar with motivational sayings. There is nothing wrong with these tips and motivational sayings in a website or book, but in a calendar it takes the focus off of what is really important; staying on track to eating fewer calories is what is important. Besides, a picture of a good looking person (guy in my case) first thing in the morning just makes me want to punch him, and a motivational saying just makes me sick at my stomach. • A place to plan your weight as you plan your life. • The results is in order (similar to a control chart) to see trends and take immediate action. 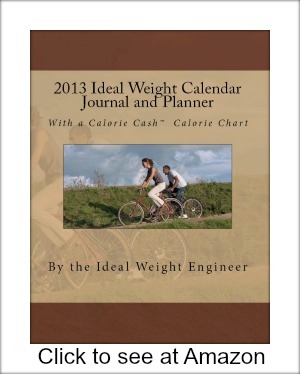 • A place to plan your calories, calorie cash™, points, servings or whatever you use to count or limit calories. • A place to journal and or use a diary so that you can record your own thoughts and use your own motivation. And yes a place to put good tips. When you write the motivation and tips, you own them. In the back of this planner you will find another weight loss tool. The calorie chart also gives calorie cash™. The calorie chart is in order with the lower calorie foods in front and the higher calorie foods in the back of the chart. For example all foods of approximately 0, 25, 50 and 75 calories are grouped together to make your food choices easier. Even if you prefer the ebook, check out the book at Amazon and then come back to this page. I can not sell the ebook on amazon because the epub format is not suited for you adding your own input on a daily basis. Download it now, before 2013 is over. After watching that video you deserve something more, so I have decided to also include my last book which I have put in pdf format as a free give away if you buy my book. It will come automaticaly if you buy the excel version. If you buy the Amazon version, you will have to come back here and contact me with the date of your purchase. Now look at the yearly weight loss calendar. The first use of a diet calendar is to decide what days or months that you do not want to be on a diet. Think of these as your diet vacations. Pick times that are always difficult to diet anyways like Christmas and or Thanksgiving. I find it easier to diet at the beginning of the year when everyone else is dieing and in the summer when I can eat lots of fruits and vegetables. You should not diet for too short a time period and you should take a break for more than a day so that you can relax. A week is a good amount of time to take a break. If you only have a little to loose, you might try additional time which you designate as maintenance weeks (I find maintenance weeks difficult, but others may not.) See below for an example of a Yearly Calendar. At first it may seem that there is little difference in a weight loss calendar and a weight loss chart, but after using the calendar you will begin to understand that with the calendar, you are building the diet into the rest of your life. Just like using a calendar is a habit, your diet will become a habit. Weight Loss Calendar for January.